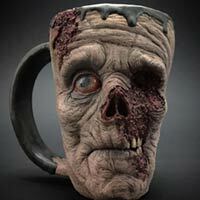 Disturbingly realistic-looking zombie coffee mugs are ideal for any horror junkie. Handcrafted by pottery artist Kevin “Turkey” Merck with clay and some epoxy resin details. He has been throwing clay on wheels for the past 15 years. He likes creating a lot of horror and monster sculptures, but snail-paced, cranium-carvers are special. Zombies are by far my favorite monsters to work on, primarily because the of the forms. Textures and color choices for zombies are nearly endless. Each zombie coffee mug is made of stoneware, coated in a food-safe glaze and fired to 2200 (F) degrees to ensure it is completely functional, durable and safe to drink from. Merck used to make them for Halloween only, but now he’s considering a year-round production cycle. This type of awesomeness will cost a bit more than your average coffee mug — starting at around $200 USD each.